You are here: Home / How to Clean an E-Cigarette Atomizer? How to Clean an E-Cigarette Atomizer? If you clean your e-cigarette atomizer then you are sure to have a better experience with it. It is very important that you comprehend the approaches that you will be able to incorporate in order to clean up the atomizer to make sure that it functions properly. It is a reusable device and this is the reason that it should be kept cleaned because it is very important to maintain hygiene. After you have used it several times the flavours can turn out to be sweeter. This indicates that the time has come to clean up the atomizer. Usually, removing it from the e-cig and then wiping it off with the help of a damp cloth is enough. Nonetheless, if for any reason your atomizer becomes absolutely junked up then you should follow the steps that have been given below. For this you might require vinegar, rubbing alcohol and plain water. Before you use a new e-liquid follow those steps. You have to start off by cleaning the areas of atomizer adapter taking the help of a lint free cloth or tissue. This is to aid you in getting rid of the moisture and the dust particles from the points that links the atomizer to the battery. This is also done to make sure that the points of connection is free from debris is very important because when the cigarette is being charged the current flows in through the sites of the adapter. After this you have to blow from the either end into the atomizer. This is very essential as this procedure helps in getting rid of the large particles of dust that have gone into the atomizer. Following this you have to make sure that you soak the e-cigarette atomizer inside a bowl that has been filled with a solution of alcohol for around ten minutes. This is an essential step as it helps in separating the clumps that are formed by the hardened saliva and the dirt or dust. This is the reason some people prefer holding the fingers just above the holes of the atomizer and then shaking it steadily. However, this depends on the person who is using it. Lay the lint free cloth on the table and then place the atomizer over the cloth. You should make the atomizer lean over a solid support to make sure that it is upright during the time that it is drying. The solution that is undesired will then drain out of the atomizer over the lint free clothing and this will dry up the atomizer very effectively. Nonetheless, you should not at all use the atomizer till is fully dry. The reason is that if you use it when it is not yet completely dry it can lead to the potential damage of the battery. There is a more proactive way of cleaning the atomizer. 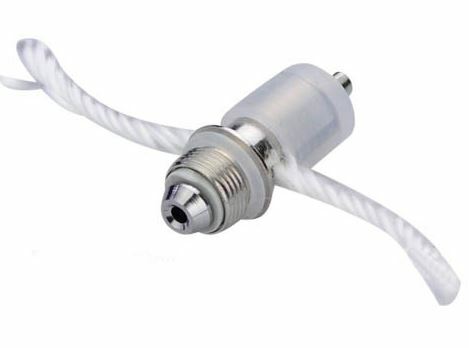 For this you have to place it over a clean cloth and then blow inside the holes that are connecting the atomizer and the battery. The undesired liquid gets cleared up. After you have blown two or three times, you have to wrap the atomizer in the tissue or the cloth and if there is still any fluid it will accumulate on the tissue.